The news about the KTM RC390 has already been confirmed and we pretty much already had a good idea as to what it looks like, atleast in its race ready form. Now though, we have photographs of the final production version along with an updated specification list. From the photographs its clear that KTM are not in anyway compromising on their traditional ‘sharp and pointy’ look. Although there are some hints of design similarity with the bigger bikes from KTM the RC390 surely goes all the way in carving itself a new identity with those bug eyes and the faired yet minimalistic approach to it. A lot can be inferred from the images that we have here also the frame and the engine remain almost the same as that on the Duke 390. The changes include a decrease in the handle bar trail for a more compact bike while at the same time balancing out with the effect of the lowered handle bars. The headlights are probably its most unique character but for us the most beautiful has to be the tail section. The sharp design along with the high tail and the LED tail lights simply are gorgeous. Our next favourite part has to be the way the design has incorporated the exhaust system, it truly gives the RC390 a premium feel. 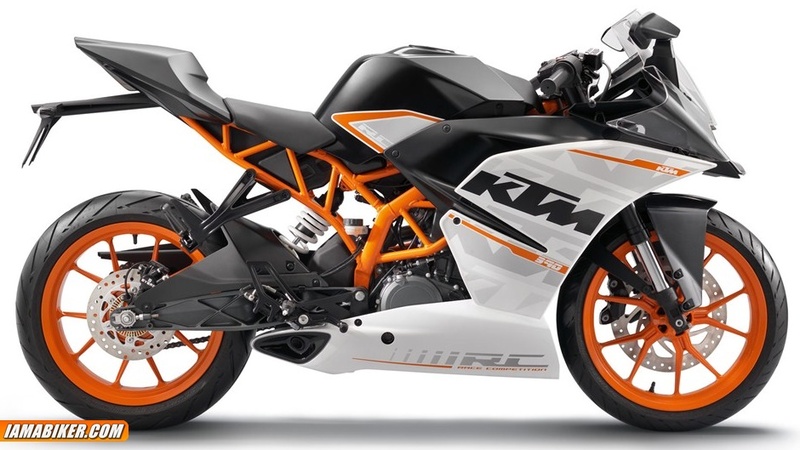 There were some murmurs about the KTM RC390 being launched in India next month, while there has been no official confirmation on that, what we know for sure is that the RC390 will be unveiled to the world at the upcoming EICMA 2013. Surely this motorcycle will be coming to India, we expect an ex-showroom price of about INR 2.35L for this sharp looking machine. Check out the specifications below and watch this space for more as we try to bring you more information about its launch.